MAX seeks to be the leading association of human service providers in the counties of Bucks, Chester, Delaware and Montgomery by supporting them to secure the necessary resources to fulfill their individual missions. MAX has developed a collaborative and proactive relationship with government officials to facilitate provider input on public policy which impact services for the individuals MAX members support. In addition to our annual spring conference, MAX develops specific training sessions and learning forums on "hot topic" issues for the membership. Quite often these sessions are included in the price of membership. One of the greatest benefits MAX provides is the opportunity to network with local fellow providers to build collaborative relationships and exchange information on cost effective, compliant, state of the art best practices. What is the purpose of max association? We strive to create a cooperative organization among the community service providers for people with behavioral health disorders, developmental disabilities, and drug and alcohol involvement and their families in order to promote continuing quality improvement of supports and needs-based allocation of resources. We develop collaborative and proactive relationships with government, Behavioral Health, Developmental Disabilities, and Drug & Alcohol officials. MAX Association had its inception in the spring of 1993 when Montgomery County MH/MR/D&A provider agencies met to discuss the feasibility of merging several smaller provider groups into one. The purpose of this merger was to coordinate and improve communications and networking, staff training, interaction with government agencies, and enhance services to individuals with disabilities. On October 13, 1993, Montgomery County MH/MR/D&A service providers met at the Holiday Inn in King of Prussia in a day long retreat to plan the Montgomery County Association for Excellence (MAX). MAX was officially incorporated in June of 2002. In 2008, MAX was approached by the Forum, a provider group from Delaware County, with a request to unite to form a regional association. As a regional association, MAX now serves over 45 provider agencies offering supports for people with Developmental Disabilities, Behavioral Health and Drug and Alcohol services in Bucks, Chester, Delaware and Montgomery Counties. 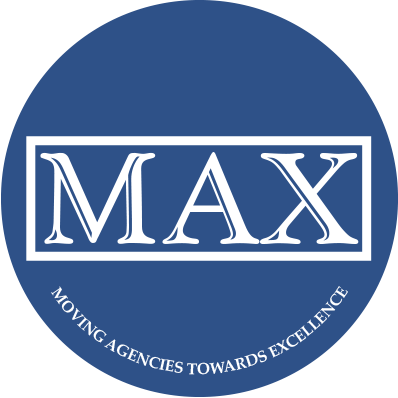 To better reflect its regional status, MAX is now an acronym for Moving Agencies Toward EXcellence.